Even after 100 years, the term “No Man’s Land” is still intimately associated with the tract of mangled earth between the front lines of the opposing armies during the Great War of 1914-1918. During the 4 years and 3 months of fighting more than 13 million soldiers were killed, wounded, captured, or simply disappeared—vaporised—by the explosive force of shelling. Under the sustained barrage, the bodies of the dead and dying were churned into the liquified earth of No Man’s Land, forming what Derek Gregory has described as a ‘corpography’. Between 1914 and 1918 the opposing armies fired an estimated 1.45 billion shells at one another along the Western Front. Of those, approximately 66 million shells contained some kind of poison gas—typically chlorine, mustard gas or other toxic agents such as white phosphorus or phosgene—burning the lungs and soft tissues of the soldiers who breathed it into their lungs. Probably the youngest surviving casualty of the war is Maité Roël, who was on a camping trip near Wetteren when she was eight and had her left leg all but severed when one of the logs the children were throwing on the campfire turned out to be a shell. Now 30 she is officially a victim of the war – ‘mutilée dans la guerre’ – which entitles her to a monthly stipend of £700 and half-price rail tickets. After the war (beginning in 1919) the French Government surveyed the former No Man’s Land to determine the extent of the damage inflicted on the landscapes and livelihoods of communities along the Western Front. The result was a colour-coded map (see above) that designated three grades of damage. ‘Blue’ and ‘yellow’ areas were noted for their moderate damage and a good chance of rehabilitation. The villages and farmland marked in red were less fortunate. 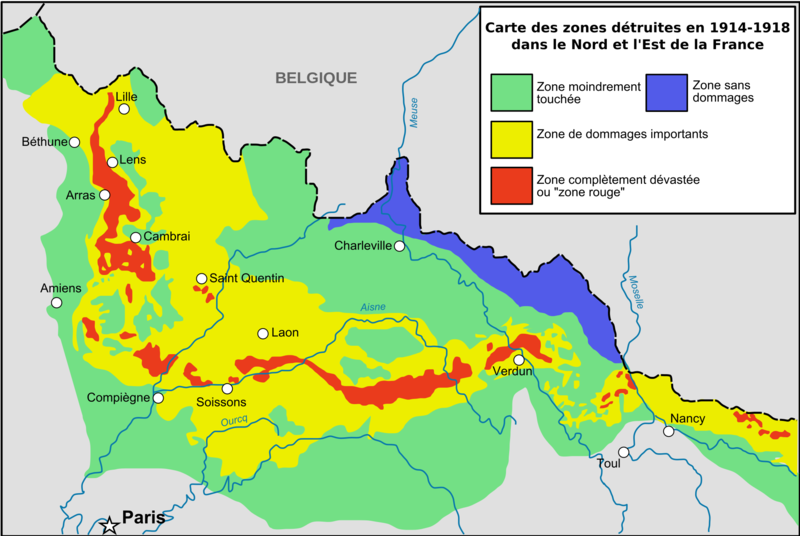 The ‘Zone Rouge’ had endured the highest levels of physical and environmental destruction. Chemical agents that leached from unexploded ammunition, shells and canisters infiltrated the soils and water courses rendering the land unfit for future human habitation for decades, even centuries. In the Zone Rouge around the city of Verdun, hundreds of acres of previously productive farmland was turned over to woodland as a means of biologically enclosing the poisoned earth with a living sarcophagus of trees. The ‘war forests’ equally enclosed the remains of nine villages flattened during the fighting of 1916. These have become known collectively as the “villages detruits” or the “villages that died for France”. 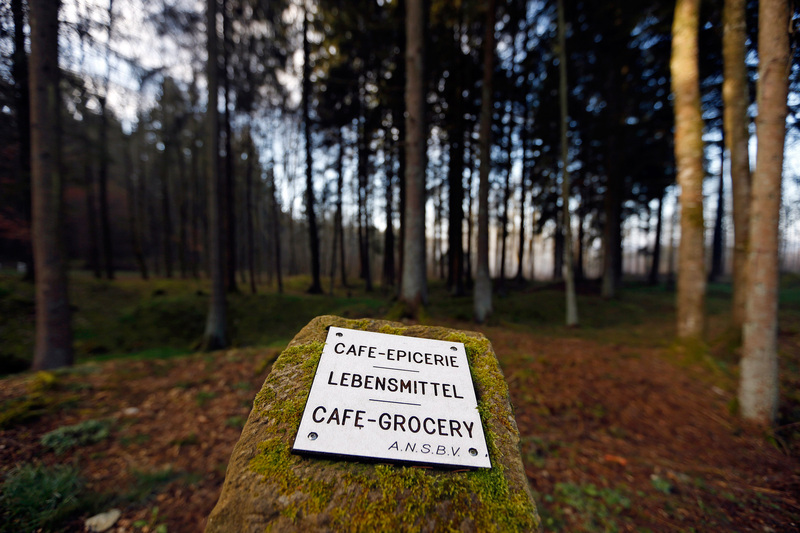 Beaumont, Bezonvaux, Cumières, Douaumont, Fleury devant Douaumont, Haumont, Louvemont, Ornes, and Vaux were all deemed to be unfit for human re-habitation after the war and, like the surrounding forests, were surrendered to nature. Today, each has a consecrated chapel and many maintain road signs and other historical markers of the villages’ distinct geographies and, as Stephen Miles notes, ‘senses of place‘. Within the Zone Rouge, the No Man’s Land of the Great War continues to exist in a state of war – with nature, and with the communities who continue to think of these abandoned places as home. During the expedition, we will be working with the artist Gabriella Hirst to uncover something of the hidden histories and geographies of the Zone Rouge and the Villages Detruits (destroyed villages), still in ruins and still uninhabited. We hope to interview the Mayors of those villages – people who even after 100 years continue to ‘govern’ places that have long been abandoned, encircled with woods and warning signs, but which remain as powerful referents of longing and memory. ← From dead zones to living spaces?